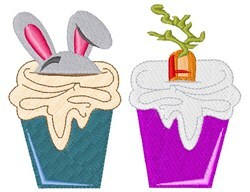 Spread Easter joy with this yummy cupcake design! Use it on gift bags, home decor or a decorative pillow! Windmill Designs is happy to present Easter Cupcake machine embroidery design which has 10847 stitches and is [82.41 mm x 65.52 mm] large. If you would like to view more embroidery patterns please search on our embroidery designs page.